1795, and a young woman called Mary Finch travels in haste from Cambridge to the Suffolk coast. She has been invited to meet her wealthy uncle - and so end a twenty-year estrangement. But before she reaches her destination she discovers a dying man on the road. He is a stranger, and yet he is carrying an oddly familiar watch bearing her uncle's initials. He also seems to know who Mary is, and hints that she is in terrible danger. His whispered warning soon exposes Mary to a ruthless conspiracy that threatens not only her family's reputation, but her very life. Far from home, Mary must learn quickly how to distinguish friend from foe. Can she trust the two men who want to help her? 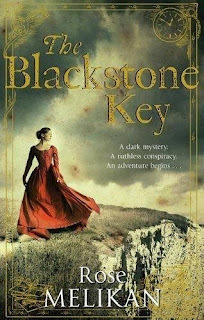 What is their interest in the mysterious Blackstone Key? Does it guard a secret treasure, or might it have a more sinister purpose...? The first in an exciting new mystery series, The Blackstone Key is a gripping and vivid historical adventure that will appeal to fans of such classic tales as Jamaica Inn. I bought this in a pack of 3 from The Book People quite a while ago and it got lost in my overflowing bookcase. When I noticed it, whilst rearranging (stroking) my books one day, my interest was piqued so I thought it was time for a spot of historical fiction. The book started well as we join Mary Finch whilst she makes her way via coach to visit an uncle she has never met. I got the impression straight away that she is a confident, brave, intelligent young woman and couldn't imagine many women travelling alone at the end of the 18th Century. On the way, her coach is stopped by a blockage in the road: an injured man. Mary volunteers to stay with this man whilst the coach goes on to raise the alarm and bring help. Mary is shocked to find that the man is carrying a watch identical to hers which belonged to her father, identical but for the initials engraved upon it: those of the uncle she is travelling to meet. As Mary continues her journey, she is joined by Captain Holland who seems to latch on to her. I was naturally suspicious of him and my suspicions increased when he accompanied Mary to her uncle's house, but thankfully he was there when they encountered a band of smugglers taking up residence. It left me wondering whether he saved Mary or whether it was all a big set up so she would take him into her confidence. Then it all got a bit confusing with a bucketload of characters thrown in and a narrative that confused my brain as to which time period I was supposed to be in. I really enjoyed the code-breaking storyline but I did lose track of all the characters and wished I'd written them down. Mary has two men vying for her attention: Captain Holland and the exotic foreigner, Mr Paul Déprez. Do both of them have honourable intentions? I then got a bit waylaid with Captain Holland's visit to Sir William. It was here that I felt the time period slipped as Sir William's daughter, Charlotte, could have just stepped out of the 1920's with her mannerisms and expressions. I'm not quite sure what value this family added to the story as it only resulted in confusing me. With a strong beginning and end, it was quite a good little story; I just felt like it lost its way in the middle and had a tendency to be a little boring. On its own, it's not one I'd recommend but I'll see how I feel when I read the next two books in the series, although I do think it will be a while before I pick the next one up.